It is easy to use PDF to Word OCR Converter to recognize Italian text from scanned PDF in Windows platforms. And this article would like to introduce you a way to recognize Italian text from conversion of scanned PDF to Word in Windows platforms. 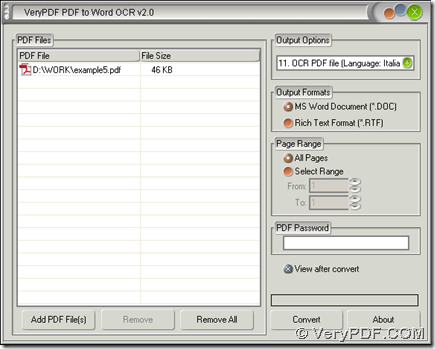 Download installer of PDF to Word OCR Converter via this link. Then follow setup wizard after you double click this installer on your computer so that PDF to Word OCR Converter can be installed on your computer. Open PDF to Word OCR Converter, then click “Add PDF Files” on interface of PDF to Word OCR Converter > select PDF file in dialog box of “PDF2Word” > click “Open”, finally, your PDF file appear as a path in processing form. Or you can use this easy way to add PDF file for this process: drag and drop your PDF file into processing table directly. Then, please set targeting format on interface of PDF to Word OCR Converter: click one of radios of “MS Word Document” and “Rich Text Format” so that your objective format is DOC or RTF. Next, if you want to recognize Italian text from scanned PDF file, technology of OCR can be used with interface of PDF to Word OCR Converter later, so on interface of PDF to Word OCR Converter, you need to click “11 OCR PDF file (Language: Italian)” on dropdown list of “Output Options” so that PDF to Word OCR Converter can help you recognize Italian text with OCR technology later. If you would like to preview DOC or RTF file after conversion of scanned PDF to Word, please click check box of “View after convert” on interface of PDF to Word OCR Converter. 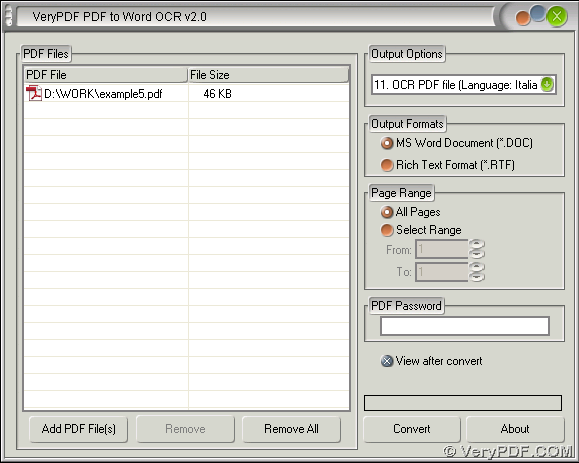 Then, it’s time to set targeting folder and produce DOC or RTF file with PDF to Word OCR Converter, and you can fulfill them with this way: click button of “Convert” > select a folder in dialog box of “Save As” > click “Save” ( if you added dozens of PDF files, this dialog box will be named “Browse for folder” and you need to click button of “OK” there), then your DOC or RTF file can be produced easily with Italian text accurately, which can be previewed automatically on your computer. If you want to get more knowledge of PDF to Word OCR Converter after you get the method to recognize Italian text from conversion of scanned PDF to Word, please go to homepage of PDF to Word OCR Converter. I want a SDK to convert PDF to DOCX, PS to DOCX, PDF to DOC, PS to DOC formats.